Published in Astronomy Magazine, December, 2006, page 95. CCDAutoPilot2.53 for data acquisition using MaximDL. Processed in CCDStack and Photoshop CS. Off-axis guided with Astrodon ROAG at an angle of 22 deg off vertical. 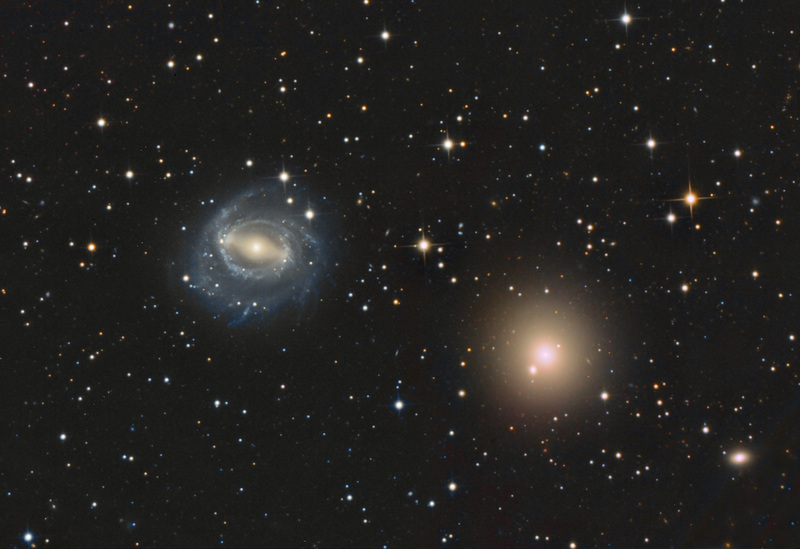 NGC 5850 according to NOAO is a disrupted barred spiral in Virgo that is thought to have formed due to a high speed encounter with the massive elliptical galaxy NGC 5846, also shown in the above image. NGC 5850 is about 4.3′ x 3.3′ with a mag of 11.9, whereas the elliptical is mag 10.1. The smaller elliptical in the lower right corner is NGC 5845, mag 13.5. Notice the tiny edge-on galaxy in the right halo of NGC 5846. North is up.